On June 1, we’ll be celebrating a year of being mostly vegetarian at our house. This will be a little round-up of what we do, and maybe more importantly, what we don’t! I am going to be honest about my reason for eating vegetarian. It’s mainly for the environment. I think that eating plants, rather than eating domestic animals raised on plants, is better for the planet. Reducing animal suffering is a side effect, but not my main rationale. I think any steps toward a more plant-based diet are better than none. In fact, I know people who hunt, fish and farm animals in ethical, no-waste ways and I have respect for that. I just don’t want to do it myself. We’ve done 3 major food shifts in the past 2 years. First we started meal planning. Next, we decided to go “Real Food” and buy ingredients to make all our meals from scratch. Finally, we went vegetarian at Rom’s suggestion. We had been eating meatless meals for lunches and 1-2 dinners a week, so it wasn’t a dramatic change-over. It took us over 2 months to use up all the meat in our freezer and start fresh as vegetarians! During that time, we ate more meat than usual, so being done with it was a welcome break. No meal skipping and filling up on peanuts, popcorn, etc. We usually have dinner at my parents’ place weekly, so 1 meal out of 21 each week would have meat. Therefore, I say we are 95% vegetarian. I figure if we weren’t visiting, my parents would still make the same roast chicken and spend the rest of the week eating it as leftovers! So the net effect on the environment is no worse. I suppose our once-a-week “crutch” might prevent us from craving meat the rest of the time. We have meals out once or twice a month, and we planned to order whatever we wanted. We weren’t overcome by meat lust, though, so we decided to start visiting all the vegetarian-friendly restaurants in Halifax instead. To start off last June, Rom cooked from Mark Bittman’s How to Cook Everything Vegetarian, and I cooked from Vegetarian Times Complete Cookbook. Everything we made was new to us. 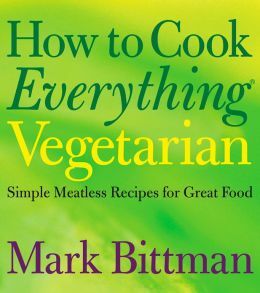 The two cookbooks were very different: the Bittman one is based on ingredients, so if you have some asparagus, you can look up ways to prepare it; whereas The Vegetarian Times was more meal-oriented (breakfasts, main courses). Over the months, I dug into several more cookbooks, and focused on one-pot meals like soups, stews, casseroles and crock pot dishes. Eventually we came up with a repertoire of meals that we like making and eating, so we have a rotation of sorts, although not a very strict one. 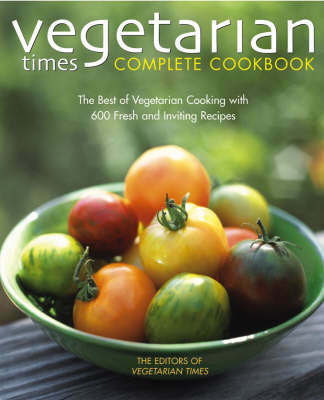 Lots of recipes – I especially like veg stews with peanut butter in them! My next goal is to make a vegetarian moussaka. We stock our pantry differently now, with lentils, beans, pasta, couscous, quinoa, rice, oats, lots of nuts and dried fruit. Then we buy fresh produce and dairy for the week’s menus and that’s it! We still buy a few packaged goods: cereal, crackers, cheese, ice cream, tea and coffee. Also canned tomatoes until I can preserve enough myself! I have not been too great about baking lately, so that means buying bread. There is no question that food, cooking and eating consume a great part of my time, but I like it that way. There is nothing else I’d rather be doing. As you can see, 12 months later, it’s not a trial run any more. One thing that helps is having that flexibility to eat meat once in a while if it’s difficult not to, or if we just want to. Knowing that, we don’t exercise it much. So we are not purists, but I think “veg enough” is working for us just fine. Now I’m sure that for some, “veg enough” is having some corn with the meat loaf! Hahaha, yuck corn :p (actually, one day I’ll post all my ‘rather not’ foods) I’m not a vegie lover, but then I’m not a meat lover either. I think I’m a garlic/cheese lover and everything else is me trying to be good (at least in the savoury spectrum!) I’m currently trying to make a suite of ‘vegie’ meals that I’ll eat as lunches, so I can indulged in less healthy, balanced dinners when I’m with company. So I’d love to know more on your soup recipes as we in Australia enter winter. I have only become adventurous about eating vegetables in the last few years. Let me know if there’s any particular soup you’d like to try. You’re right! Rom has since found a better lentil loaf recipe. But I got my nut loaf recipe from Economies of Kale! Ooooh. I would love to see that recipe for carrot walnut burgers someday! That one I will post. Congratulation! what a great idea to try veggie diet as an experiment without all the pressure that a rigid promise to follow this forever would bring. my current diet is mostly whole food vegan with an egg occasionally, except when out. I won’t ask people to make something special for me and will make the best choices I can with what is offered. if I had thought to make rules similar to yours I think my first attempt would have been much more successful. I had a first attempt when I was in my 20s that lasted less than a week! I didn’t especially like vegetables and wasn’t really willing to cook. I think I lived on cereal and peanut butter sandwiches. It is so helpful to see that list of “typical meals.” It can be hard to imagine what a vegetarian diet looks like if you haven’t lived it before. I also find it very helpful to see the average grocery costs listed! Thanks. I would say that vegetable stews and chilis are what we make most often. We now cook 2-3 recipes a week and have them for a couple of nights. We have saved money, I suppose at the cost of convenience, but I’m OK with that. We would save a lot more without dairy products (expensive here) but that is not happening. 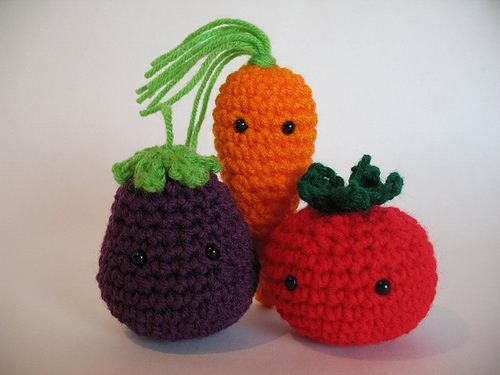 Oops…forgot to wish you a “Happy Veggie-versary!” That’s a huge lifestyle change…well done on such a great effort! Thank you. To me it’s less effort than buying, storing and cooking meat. The bigger adjustment was the Real Food – giving up packaged stuff. Congrats for the anniversary! I’ve been a vegetarian all my life, and since two years, I’ve been cutting away the rest of fauna-based things too, first dairy products (this was easy as my spouse is allergic to milk protein), then fish, and now I’m left with the occasional egg, and sometimes cheese when I fall for a chunk of Brie. I won’t leave honey, though. One thing that has made my life easier is making seitan. Have you tried it? Many recipes make it seem difficult, when in effect it’s just mixing the gluten flour with water and adding the spices you like. I heartily recommend it! I don’t think I’ll be going any further toward veganism, but it must be a natural transition. I have never tried seitan! Thanks for the suggestion. I can’t quite imagine what the texture would be like. Maybe I’ll buy some once to give it a go. I can’t see any reason why I wouldn’t like it. I’ve never eaten meat, so I can’t say for myself, but some people say seitan is textured like chicken… One thing I can say for sure is, it’s a pretty good stomach-filler. My favorite use for it is stewed with tomato in the oven for a couple of hours, with rosemary and a touch of chili. But usually I just throw it on the pan with salt, pepper and oil, it’s easiest that way. What a delightful repertoire! The soups, classics, and stews sound especially mouthwatering. I have been a pescatarian for most of my adult life, but since I have been living away from home, dinners often mean steamed vegetables — unthinkable to some, I know — and steamed salmon. Bread and fruit for the other meals. I am a terrible cook, as you can tell. But I get by. Now, your curried winter vegetable soup is making me salivate. I am going to look up the recipe for this. 🙂 thanks for the great post. Thanks – I have emailed the recipe to your gmail address! I could probably get by on steamed vegetables and bread too, in a pinch. It’s interesting that a lot of people in the comments have said they have no idea what vegetarians eat. I used to do a lot of volunteering and living on campsites where we did communal cooking, and other people struggled with catering to vegetarians. I would usually end up helping in the kitchen (to avoid eating meals of potato-based veggie burgers served with potatoes! ), and always felt like I was spreading the word about the vegetarian diet. 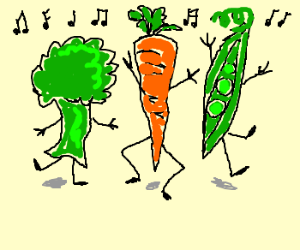 It does seem that a lot of people can’t imagine a vegetarian diet. I would guess it’s because they think of a plate with potatoes and vegetables, and a gap where the meat should be, that can only be filled by tofu! But if someone already eats soups, stews. chilis, curries and casseroles (with meat), then they will do fine without! You know, it’s so very interesting to me that people report losing weight when switching to a vegetarian diet, because my experience has been just the opposite. I was a vegetarian most of my adult life and finally gave it up a year or two ago. I guess maybe the fact that I’m allergic to most nuts and have to limit my intake of both legumes and dairy made me a special case – I always felt like my blood sugar was bouncing all over the place. Or maybe it’s that I don’t eat a ton of meat – usually about one small serving of either chicken or fish per day. Anyhow, congratulations on finding a system that works for you – especially doing it all without processed food substitutes! I wouldn’t say I have lost weight, but it’s much easier to maintain without the processed food. It’s like Michael Pollan says, sure, have snacks, as long as you make them yourself! I think I’ve failed to go vegetarian or pescatarian about 5 times – I obviously don’t want it enough. My excuses: a meat loving husband and a lack of interest in cooking. I think it’s brilliant how you’ve changed you’re eating habits and really like your 3 step plan. Thanks, Laura; Rom is the one who wanted to give the vegetarian part a try – I wouldn’t have had the commitment myself otherwise. Or rather, I needed the kick start! Congratulations! We are in the stage of meal planning, cooking from scratch and eating a couple of vegetarian dinners per week. When we do eat meat we are trying to eat less of it and buy ‘local’, ‘raised without’, ‘free-range’ etc. cuts. But it is hard to be sure of our meat and how the animals were raised etc. and I can see why a move to eating a vegetarian diet would occur. I also do this for environmental reasons more than personal health or animal suffering reasons. Maybe I will be brave enough to move to the next step as you have – I don’t think it will be at my spouses initiation though (it was a huge step for him to give up luncheon meat and make pasta sauce without mince lol). Anyway, I do also track all of our spending and a lot of the websites I read about finances and frugal/simple living seem to be US based so I can never really compare food costs since their food seems so much cheaper than ours. Looking at your costs though, we still seem high. For food alone (no paper products, cleaning materials, pharmacy, beauty supplies etc.) we are at $557/month for 2 people in Ontario! We are not overweight people nor are we super fit needing a lot of calories either. You were only at $528 including other items – did this include your pharmacy and ‘beauty’ supplies e.g. shampoo too? Ugh, I have no idea why I am still so high with meal planning, shopping sales, minimizing food waste etc. I know the farmer’s market in the summer takes a toll on our budget though (we are not in the position to have a garden at this time). Hi Lisa, Thanks for stopping by! I think $557/month is probably average for a couple that is not on a tight budget. I include paper goods and cleaning supplies in mine, but not personal care/pharmacy or pet stuff. I used to spend $50/month+ on personal care but am now down to about $15, and our cats cost us about $20/month! I have actually been avoiding the farmers’ market a bit, because ours is touristy and expensive, and you can get local produce elsewhere cheaper. One habit that really helped me was not to keep a full cupboard any more. When I used something, I used to automatically replace it. Now I don’t – if it’s not on the meal plan that month, I don’t need it. I don’t stock up too much either, because we don’t eat much packaged food. We have dramatically cut down on snacks. I still have a few splurges like goat cheese and pesto! I know that in Ontario, your dairy products cost a fortune like ours do. It’s great that you are paying attention – but you’ll know when “enough is enough” – I would not cut back excessively on food unless it was an urgent budget problem! I am really enjoying your blog. Thanks for writing! No, it is not urgent that we cut our food budget, I just simply wonder if I could do better and why our monthly amounts seem so much higher than others. Now I am going crazy wondering how you only spend $20/month on your cats! Our litter alone is $30/month (wheat stuff) and their food is at least $65/month (canned Wellness). Never mind the recent expenditure just this week of $1300 for dental surgery (again). Then factor in one large dog with a thyroid condition – I am not going to admit my monthly pet amount now lol!